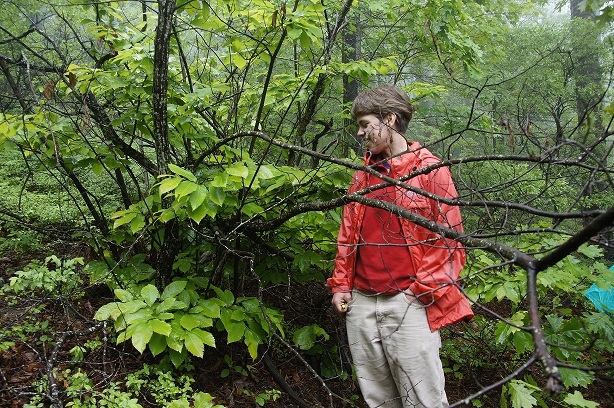 A group of die-hard native plant lovers met in Crystal Springs on a rainy May 16 in pursuit of black huckleberry (Gaylussacia baccata), the only true huckleberry in Arkansas. Arkansas Native Plant Society (ANPS) members in attendance were Susan Hooks, National Forest Service botanist and trip leader, Virginia McDaniel, Martha Bowden, John Simpson, Eric Sundell, Nancy Weatherford and Mike Weatherford. Susan was very ably assisted by Terry McKay of the Ouachita National Forest. Rain showers occurred intermittently throughout the trip, but that did not deter the group. Pale green leaves of black huckleberry mixed with deerberry. The first stop, in Montgomery County along Forest Service Road 177 about five miles southeast of Mt. Ida, yielded the target species. 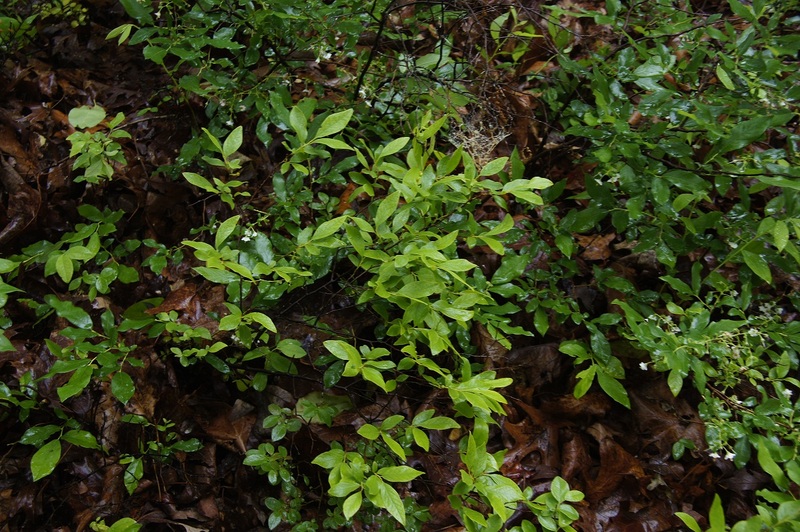 Black huckleberry plants were mixed with species of true blueberries (Vaccinium spp.) including deerberry (V. stamineum) and low-bush blueberry (V. pallidum). 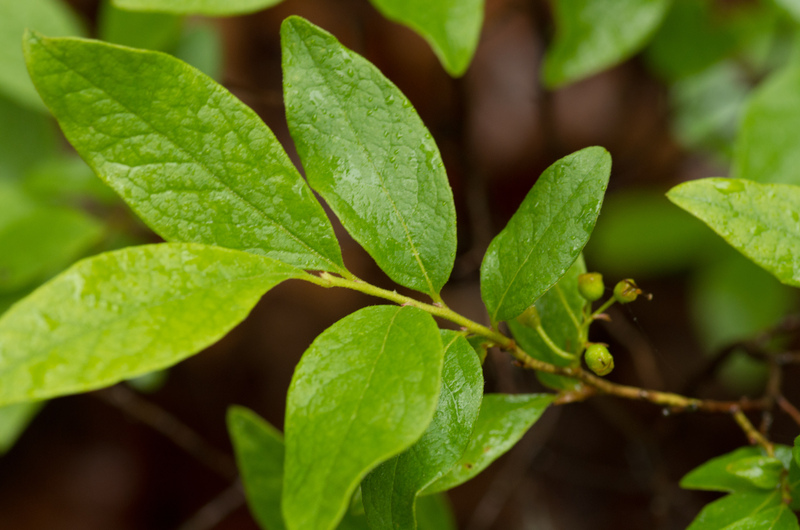 It took the finely-tuned eyes of Susan and Terry to distinguish the black huckleberry’s slightly lighter colored leaves from those of the blueberries. 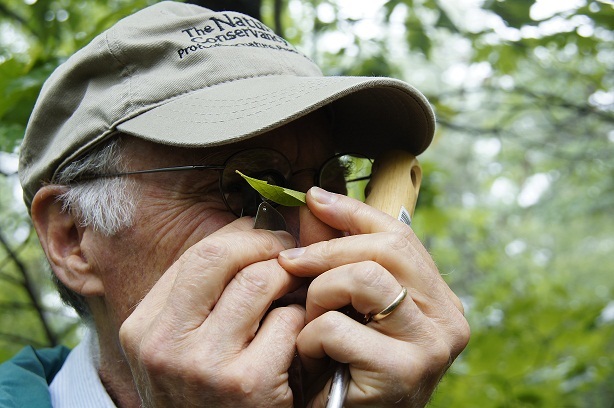 Identity was verified by using a hand lens to view the characteristic tiny orange glands on the leaves and stems of the huckleberry. Everyone in the group was satisfied to have found and identified this rare plant except for Eric, who still longed for the “full black huckleberry experience”. Susan has promised to collect fruit when it is in season so Eric can taste and examine the stony fruits which have seeds enclosed in hard bony protective coverings, unlike the blueberries which have free seeds. Nearby on the same site we found Ozark chinquapin (Castanea ozarkensis) stump sprouts. Like those on other typical sites, they do not reach any significant height before once again being killed back by chestnut blight. Multiple generations could be seen in the live sprouts and dead stems both standing and scattered on the forest floor. We also found farkleberry (V. arboretum) and flowering dogwood (Cornus florida) in fruit. The second stop was at Collier Spring, also on USFS Road 177. 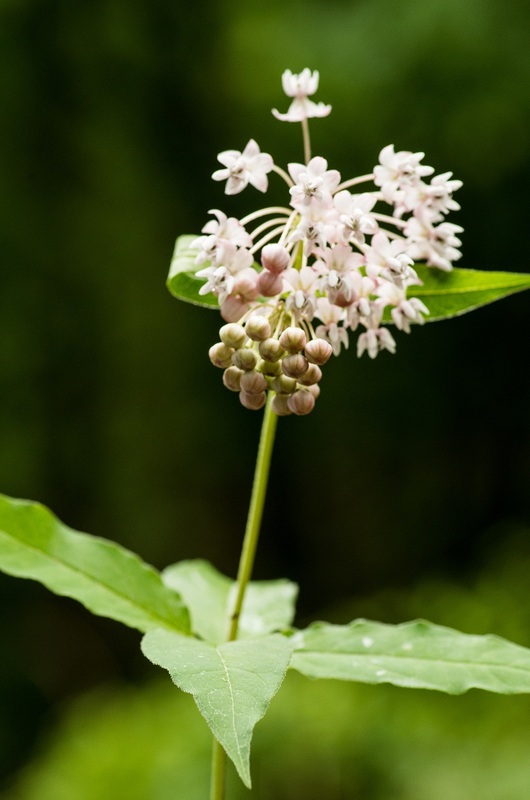 Eric spotted a fourleaf milkweed (Asclepias quadrifolia), a deep-woods delicate species unlike most other milkweeds which require a lot of sun. Virginia, an enthusiastic grass and sedge botanist, found Carex laxiculmis, a rare sedge. We also added another blueberry species to our list, V. virgatum. The final stop was at Crystal Campgrounds near Norman, also on USFS 177. During rain and thunder we identified cucumber magnolia (Magnolia acuminata), umbrella magnolia (Magnolia tripetala), black gum (Nyssa sylvatica), mockernut hickory (Carya tomentosa), black walnut (Juglans nigra) and specimens of two introduced tree species – yellow poplar (Liriodendron tulipifera) and large specimens of white pine (Pinus strobus) planted more than 100 years ago. The trip was very interesting. Many thanks to our leaders, Susan and Terry. But what do May flowers bring? On a field trip fling! How do the berries taste? Are they sweet or are they tough? To see our lady’s slipper friend. This entry was posted in Field Trips, Native Plants, Shrubs, Trees, Wildflowers and tagged Apocynaceae, Black Huckleberry, Carex, Castanea, Castanea ozarkensis, Cyperaceae, Ericaceae, Fagaceae, Fourleaf milkweed, Gaylussacia baccata, Magnolia, Magnoliaceae, National Forest Service, Ozark Chinquapin, Vaccinium. Bookmark the permalink.